WASHINGTON -- The widow of a U.S. Navy SEAL killed in Yemen stood in the balcony of the House chamber, tears streaming down her face as she looked upward and appeared to whisper to her husband. 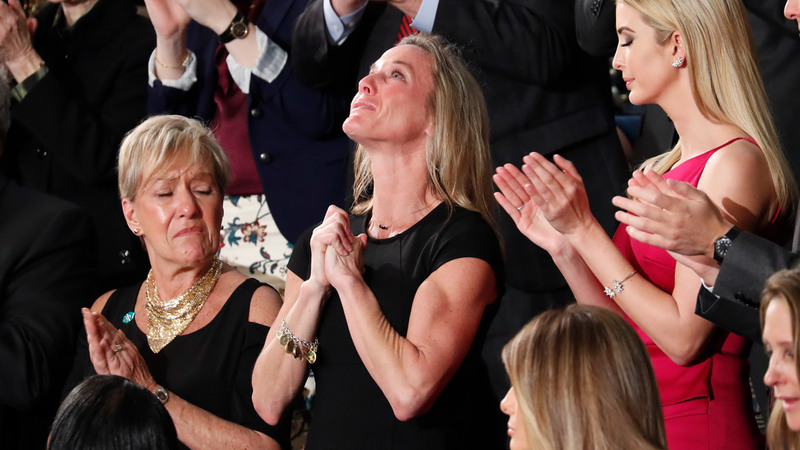 Democrats and Republicans alike stood for minutes to applaud Carryn Owens, giving her the loudest cheers of the night in a rare moment of unity during President Donald Trump's first speech to a joint session of Congress. Her husband, Senior Chief William "Ryan" Owens of Peoria, Ill., was killed last month in a raid approved by Trump, a decision that has been sharply criticized by some - including the slain SEAL's father - and which Trump continued to defend Tuesday night. Trump, near the end of his hour-long speech, paid tribute to Carryn Owens, a surprise guest whose presence in the first lady's box was not announced in advance by the White House. "The challenges we face as a nation are great. But our people are even greater. And none are greater or braver than those who fight for America in uniform," said Trump, who said they were "blessed" to be joined by Owens. The president then turned to the balcony where Owens sat next to Trump's daughter, Ivanka, and said "Ryan died as he lived: a warrior, and a hero - battling against terrorism and securing our nation." The chamber roared with cheers as Owens stood and cried, creating what would likely become the signature moment of Trump's address. But Owens' death, as well as the killing of several civilians, has raised questions about the effectiveness of the raid, and Trump took a moment to again litigate the decision. He quoted Defense Secretary James Mattis defending the action, saying "Ryan was a part of a highly successful raid that generated large amounts of vital intelligence that will lead to many more victories in the future against our enemies." "Ryan's legacy is etched into eternity," Trump said. "For as the Bible teaches us, there is no greater act of love than to lay down one's life for one's friends. Ryan laid down his life for his friends, for his country, and for our freedom - we will never forget him." He also struck an awkward note, saying that the prolonged ovation would have made Carryn's slain husband "very happy, because I think he just broke a record" for applause. Carryn Owens cheered the president's remarks. But Owens' father, Bill, has denounced the raid that took his son's life and refused to meet with Trump when the president greeted the Navy SEAL's remains when they were returned to the United States. He told the Miami Herald last weekend that the raid was a "stupid mission" and called for an investigation. "Don't hide behind my son's death to prevent an investigation," the elder Owens warned Trump. He did not attend the speech.